Conjunctivitis is often cause for much concern for parents, teachers and nursery staff, leading to confusion about whether affected children should be allowed to attend nursery or school. Official advice from Public Health England is that exclusion of children with conjunctivitis is not necessary (goo.gl/VfvR57 - see page 7). Furthermore, the idea that conjunctivitis should be treated with antibiotic eye drops or ointment flies in the face of a growing body of opinion in the medical community that this is unnecessary, on the basis that the vast majority of cases of conjunctivitis tend to be relatively mild and will resolve spontaneously. To quote from the NHS Choices website: “Infective conjunctivitis rarely requires any medical treatment because the infection will normally heal by itself, usually within one or two weeks. For most people, the condition does not cause any complications.” (goo.gl/MQSaqH). The widespread use of antibiotics has been blamed for the emergence of “superbugs” such as MRSA which are resistant to most or all antibiotics. There is therefore increasing pressure on us all not to use antibiotics unless absolutely necessary. A leaflet from the Department of Health summarises this argument (goo.gl/QPFN7N). The danger of a policy which encourages parents to seek the prescription of antibiotics is that it turns a mild self-limiting illness into a medical emergency, as parents seek medical attention after they have returned from work and before their next working day. This in turn places unnecessary pressure on GPs, out of hours services and urgent care services for a condition that usually does not require medical intervention at all. 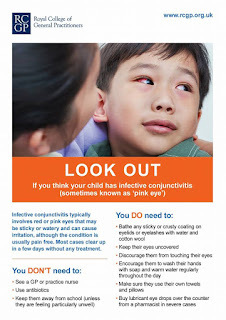 It is therefore important that children with simple conjunctivitis are neither excluded from nursery or school nor their parents encouraged to seek antibiotics. Local health protection teams are another great source of advice. Find yours at www.gov.uk/health-protection-team. @DrJohnCosgrove Excellent reference. We've been giving our pts reference to this article. Ab and exclusion issues need highlighting. I sent an email to our nursery manager with a link to your blog. She replied that she was happy to have someone in the nursery with simple 'viral' conjunctivitis but would like them checked over by a dr first to ensure it was nothing else. We had a chat about this and I suggested that classic symptoms should be reassuring however if concerns perhaps it would be more helpful, quick and less burden on the NHS if the advice was to ask a pharmacist whether there were concerns. She has changed the policy to this effect which is helpful. I don't know however whether most pharmacists will just advocate chloramphenicol anyway, but I thought at least it would prevent another GP appointment being wasted. Good result, thanks for sharing, Louise! I wonder if nursery managers would benefit from basic training in diagnosis and management of common childhood illnesses?